But how big? 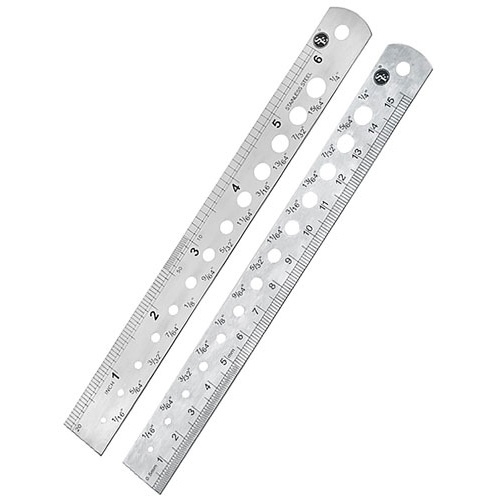 Our handy stainless steel ruler with built-in drill gauge measures 6” in 0.1” increments and 15cm in 1mm increments, plus it has a set of (13) drill gauges from 1/16” to 1/4” in 1/64” increments. 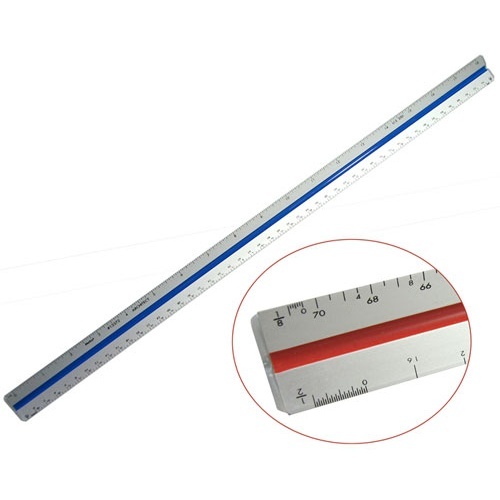 From Helix®, this 18" long aluminum U.S. Standard triangular architects' ruler/scale has color-coded facings and is divided into 3. 1-1/2, 1, 3/4, 3/8, 3/16, 3/32, 1/2, 1/4 and 1/8 inch per foot. Yes, you can use it even if you're not an architect. 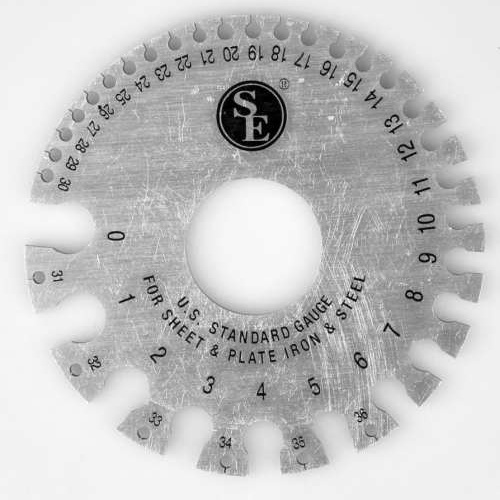 This 3-5/16” dia double-sided wire gauge wheel measures from 0-36 AWG on one face and from .005" to .325" on the other. It’s for non-ferrous metals, which is pretty much all of what you run across anyway, unless you’re Ferrous Bueller. Whenever we drop in on our tailor for a fitting, he's got a tape measure hanging around his neck. So much more attractive than wearing a metal on his belt, we think. 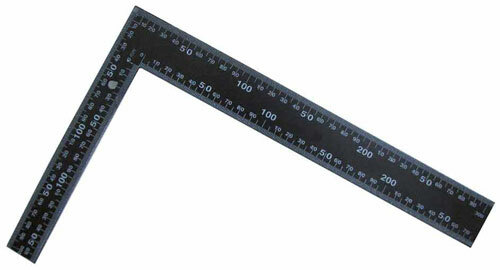 More useful too, when measuring humans. 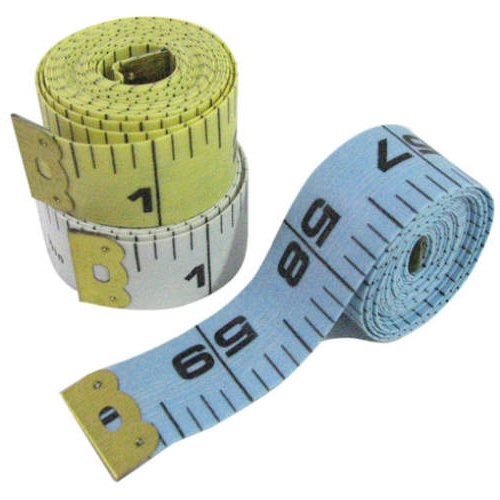 Now you can be a tailor too, with our tailor's tape measure in a soft fabric-like PVC material. Measures 60" (152cm) x 3/4", marked in 1/8" increments on one side and 1mm increments on the other, with metal tabs on each end. You'll get (3) in some combination of white, light blue and yellow. 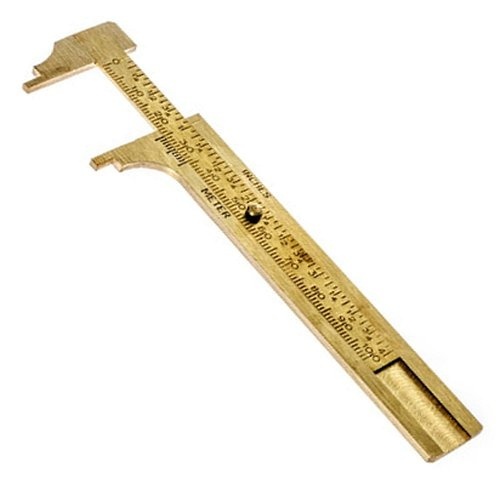 Sometimes, in a world of electronic measurement, you just feel like using a well tooled solid brass instrument--like this old-school vernier caliper. 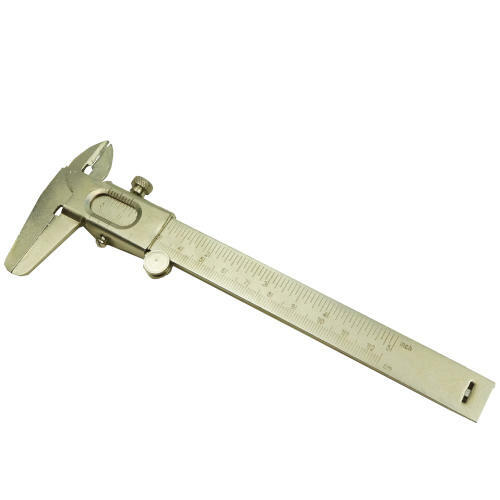 Has 4” x 1/16” and 100mm x 1mm scales that can be pulled apart to double as a depth gauge. Also very satisfying just to hold in your hand. Plus, it fits in your pocket! Electronics. The best thing that ever happened to calipers. Save your eyesight and measure accurate outside and inside dimensions with this digital instrument. Powered by an included button-cell battery, it measures up to 6 inches in .001 increments or 155 millimeters in .01 increments. Hardened stainless steel, 9-1/4" x 3" OA, with a locking vernier, it comes with a nice sturdy storage case and extra battery. Banish plastic calipers. Replace them with these brushed stainless steel locking calipers. 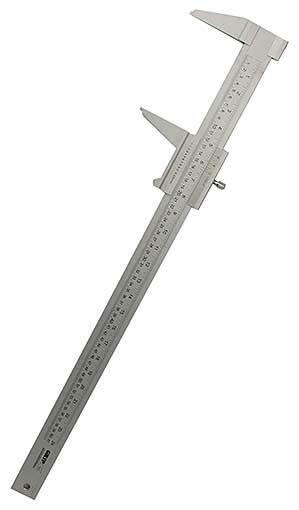 They measure spans up to 5" in 1/16" increments and 125mm in 1mm increments, and these are real beauties. 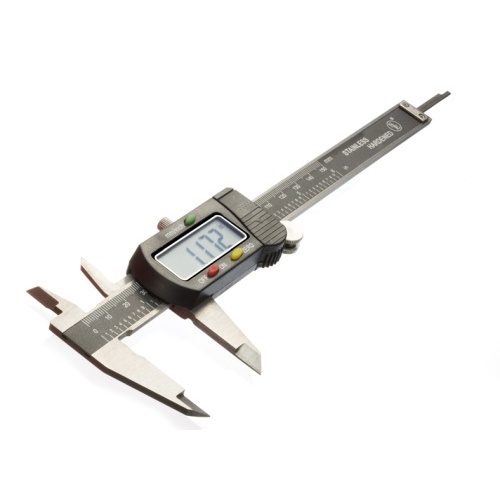 Terry's buying a pair to use as a paperweight and have them on his desk, just in case calipers go the way of the slide rule and micrometer. Figures he owes it to his future grandkids to introduce them to these cool tools. We're in love with this little bugger. Slide this neodymium magnetic tip onto your 1" wide steel tape measure and it hangs on to steel surfaces by itself (attention electricians, plumbers & sheet metal workers) plus it has double top tabs so it will hook onto things above it, plus plus (here's the best part) it turns your tape into the longest pick-up tool on the planet. Nice small carpenter's square for the toolbox. In black steel with easy-read white markings up to 8" (202mm) and 12" (302mm). Graduated in 1/16" increments on one side, 1mm increments on the reverse. Not in bad taste, but paper tape that will stick to a surface when keeping a measurement is just as important as taking one. 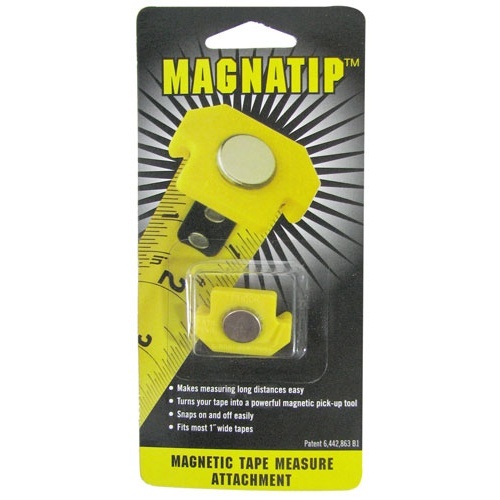 This 32-foot x 15/16” wide measuring tape has the stickiness of a sticky notes so it will stay put while you drill or cut, or whatever. 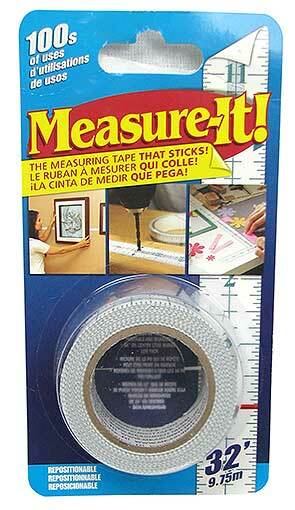 Marked in 1/16” increments, it’s particularly handy for hanging pictures. Made in Canada, where they know how to stick with things.